Preheat oven to 375 F. Cut stem and flower ends off zucchini, trimming off the smallest possible amount of the skin and taking care to cut it off evenly, since this will show. 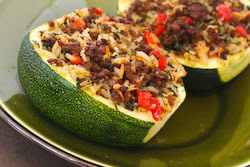 Cut zucchini in half lengthwise, then using a pointed teaspoon or melon baller, scoop out and discard most of the zucchini flesh and seeds, leaving an even 1/2 inch of flesh attached to the skin. If your zucchini are rolling around a lot, you can cut a thin slice on the bottom side of each to make them sit up. Microwave zucchini 3-4 minutes on high. Heat olive oil in heavy frying pan and saute chopped onions and peppers until they are just starting to soften, about 5 minutes. (They will cook more in the oven, so they don't need to be fully cooked at this point.) Remove onions and peppers to large mixing bowl, then add ground beef to hot pan and cook until starting to brown. When meat is about half cooked, season with Spike Seasoning and ground fennel and add garlic, and continue to cook until meat is well browned, breaking it into small, pieces with the side of your turner. Remove cooked ground beef to mixing bowl. Add cooked brown rice, chopped basil, Parmesan cheese, and chicken stock to meat and vegetable mixture, and gently combine. Choose a roasting pan with slight sides, just big enough to hold the zucchini. Spray pan with nonstick spray or a light misting of olive oil. Stuff zucchini with stuffing mixture, packing in as much as you can into each zucchini, and mounding it up as high as you can, until all stuffing is used. Put zucchini into roasting pan, putting them close together so they hold each other stuffing-side up. Roast uncovered 20-30 minutes, until zucchini is tender-crisp, and filling is hot and slightly browned. Serve hot. This will keep well for a few days in the refrigerator and can be reheated in the microwave. Use turkey Italian Sausage instead of ground beef. Use thin tomato sauce instead of the chicken stock. Add some chopped olives to the stuffing. Use sauteed mushrooms instead of or in addition to the red pepper. Use feta cheese instead of the Parmesan.